Whenever you are planning to go for an Umrah trip, it is always a terrific idea to make a checklist of the various necessary things in order to avoid any problem or issues that you may have to face as a result of missing one of the much-needed document or item. There are a lot of checklists available online suggesting various necessary things you need to carry with you. 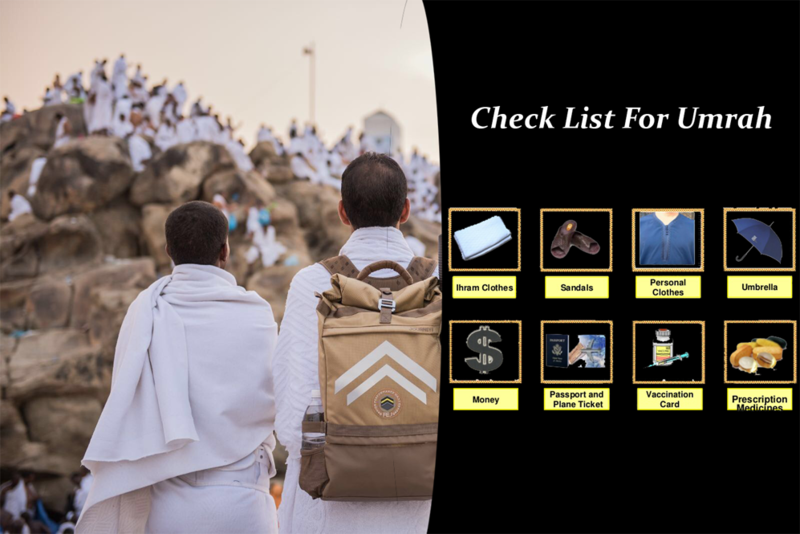 It can be extremely beneficial to consult these Umrah checklists in order to prepare a final checklist of your own so that you can be sure that you are not leaving behind even a single needed item. • An authentic Umrah guide which you can easily understand. • A small pouch you can hang around your waist or neck which is sufficient to contain your ATM cards, passport, flight tickets, health certificates etc. • A durable waist belt which you need to employ in order to tie your Ehram. • A mat which can be used for offering prayer. • Necessary clothes, especially if you are going for an Umrah trip during the winter season, make sure to keep your warm clothes, jackets, blankets etc. • Your glasses, especially if your eyesight is weak, it will be better to keep extra glasses with you while going for an Umrah trip. • Although not necessary, at times you may find it useful to carry a small bottle for carrying water with you. There are several bottles easily available in the market which you can easily hang around your neck. • Medicines for flu, fever, diarrhea, cough, constipation, any other medicine which are regularly using. • Strong and durable bag or bags sufficient to hold all your needed stuff. • A lock for your bags but make sure to keep the key of the lock safe with you otherwise you may need to cut your bag with large scissors in order to take the required stuff and till you purchase or arrange another bag, it will become extremely difficult for you to carry your stuff with you. • Prefer to carry such bags with you which have wheels attached so that you need not to constantly lift heavy luggage for a longer duration • Optionally, you may carry a pen or ballpoint with you which can be handy if you need to write down something. • Saudi Arabian currency in sufficient quantity. Although, you can exchange your local currency at the airport in order to get the Saudi Riyals you need to keep in mind that you will be getting very bad conversion rate at the airport. Therefore, try to get your local currency exchange for Saudi Riyals before leaving your hometown in order to get the best possible exchange rate. • UK identity card. You may not need it while in Saudi Arabia but it may be required when you return back. The above checklist highlighted the various needed things during an Umrah trip. However, you can consult more checklists and amend this checklist as per your own requirement. To fulfill the wishes of the pilgrims who want to perform Umrah Cheapumrahpackage.org.uk is here to give them complete and best Umrah services from United Kingdom. We now offer to our customer’s best and cheap December Umrah Deals. So do not lose time and take advantage of this great opportunity to perform Umrah.